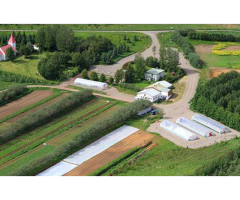 Organic farm (350 ha) since 1979 located in east Iceland, the most beautiful part. Main products are potatoes, vegetables, grains, massage oils and vegetarian burgers.. We have since 1984 planted 1 million trees for shelterbelts and forest. Work includes tree planting, weeding, hoeing, vegetable planting & harvesting, packing, prepare for markets, cleaning, kitchen help. Accom for 2 in my home and two in a small apartment. Vegetarian meals. Children by arrangement. NSI.